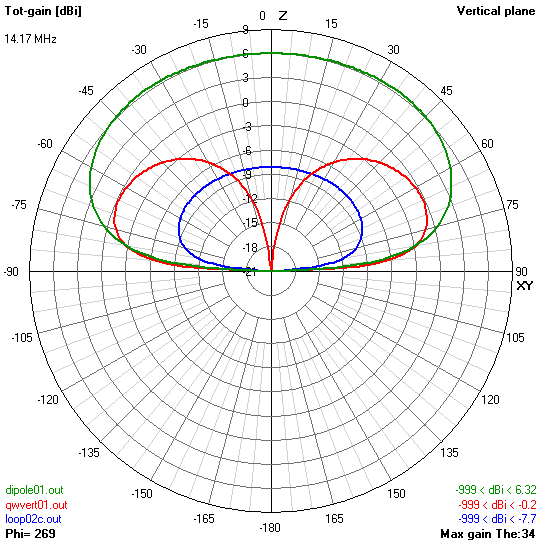 Above is a comparison of gain in the plane of maximum gain of the STL and dipole. 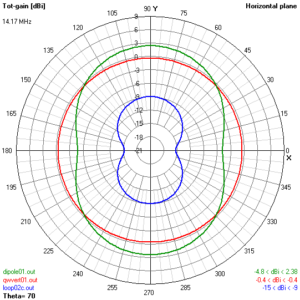 The gain of the QW vertical might be surprising initially, but keep in mind that it is a QW vertical with four radials mounted 0.5m above real ground. At the zenith, the dipole is a standout winner so for NVIS it is the obvious choice… however NVIS is not such a common mode for SOTA on 20m. Above is the polar pattern at 30° elevation. 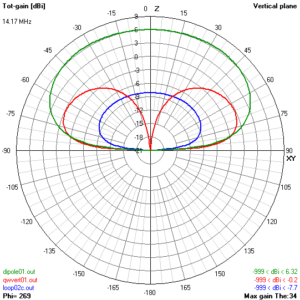 At some azimuth angles the dipole is better than the QW vertical, and vice versa at others… on average there is not a lot in it. The consistent and large loser is the STL. Hams wax on that a QW vertical is the best thing for DX. Broadside, the QW vertical is superior at elevations less than about 13°, and some DX is at such low elevation but some is well higher. End on and the picture is quite different, the chart above shows that at 30° elevation the QW vertical is around 4dB better. How do you reduce this to a single dB figure of merit without making crude assumptions that discard important detail of the differences between the antennas. A field trial will provide comparative results, but they will depend on the stations contacted, including their direction and path elevation. Individuals will have their own ideas about which is more convenient for deployment, anecdotes about what works and what doesn’t but there is a scarcity of methodical formal scientific field experiments, it just isn’t the amateur’s way. Richard’s (G3CWI) experiment Comparing the performance of an inverted vee dipole with a small transmitting loop on 20m is an exception though it excites defensive criticism of hams with certain beliefs (aka prejudices). 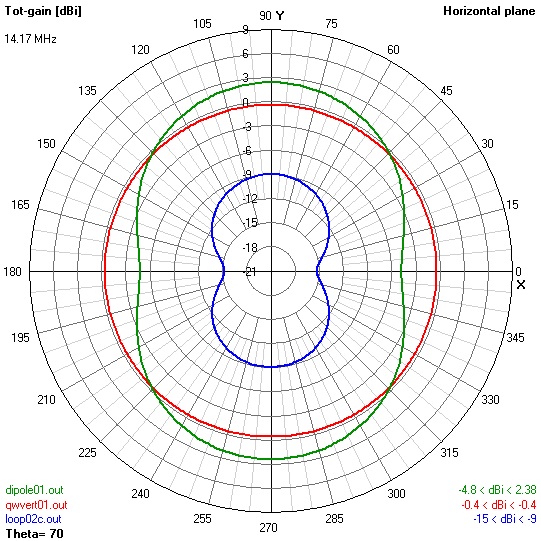 The results Richard obtains are quite consistent with valid NEC models of the two antennas, an experiment comparing a QW vertical (typical of SOTA deployment) with the same STL would be interesting.